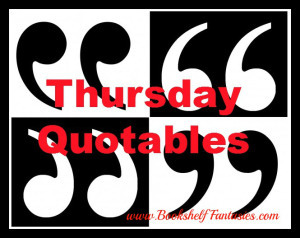 Thursday Quotables is a weekly feature hosted by Bookshelf Fantasies. It is a weekly feature where readers highlight a quote or quotes from their current weeks reading. Whether it’s something funny, startling, gut-wrenching, or just really beautifully written. I wasn’t sure if I was going to do a Thursday Quotables for this week, but after finishing up UnDivided over the weekend, there were enough quotes in there that resonated with me (especially in this time of upcoming political elections) that it just seemed right. As a bit of background, UnDivided is the 4th book in the UnWind Dystology by Neal Shusterman. The premise of this dystopian series is that there was a war known as the Heartland’s War fought in the past, and as a consequence, teenagers started to run wild. So the government instituted a program called Unwinding – which was basically taking an teenager and surgically disembodying them, and the parts were then used for transplants or cosmetic desires. It is set in a time, when all body parts (including portions of the brain) could be easily divided and used. I came across this series a few years ago, when it was only one book (and hadn’t heard that there was going to be follow-on ones) and while horrified in places, also enjoyed the writing style and the questions that Shusterman posed. I love that last quote,it’s really true! The choices we make really do affect us, no matter how small. Great choices this week!